Staring deep into the vortex of the image above, I can't help but think about a monologue by Rutger Hauer's replicant character Roy Baddy in the movie Blade Runner. "I've seen things you people wouldn't believe." "...I watched c-beams glitter in the dark near the Tannhauser Gate." In the beautiful universe of The Plant Provocateur, I will take liberties in assuming that c-beams mean cactus beams from cactus flowers. On a recent visit to the Huntington Botanical Gardens I experienced an out of body experience of sorts. Cactus flowers of many varieties were in full bloom. To really see one up close, live and in concert, is truly something to behold! 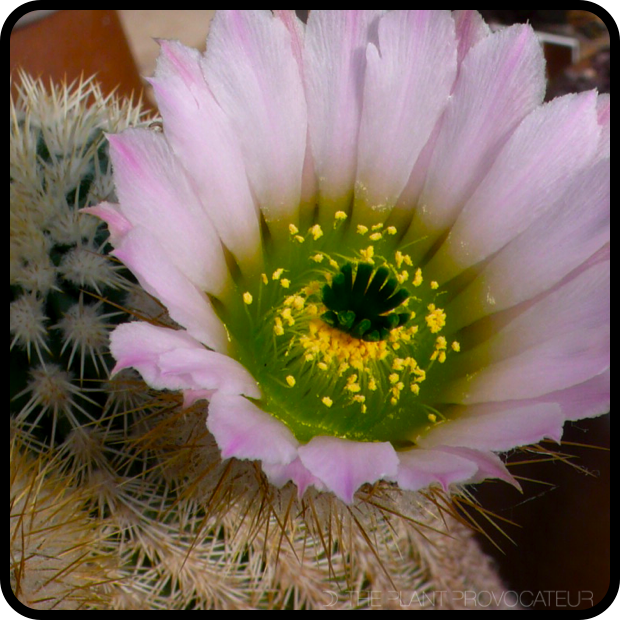 Inside each and every cactus flower I saw a universe of captivating color and form. This experience was so inspiring I had to share it with you. So this post is coming to you in two parts. The opening image comes from the spectacular flower of a cactus known as Echinocereus grandis. It's like something I've never seen. Shapes and tones within the pink-blushed soft white petals of this cactus flower take on colors of lime, lemon, jade, and velvet green. I'm seriously spellbound by how beautiful this is and how it makes me feel. And all of this coming from a plant that is as wicked as it is wonderful. Cactus are extraordinary in their ability to handle adverse situations and still produce such miraculous floral forms and color! Take for instance, the cactus flower of Thelocactus bicolor. Let its bloom jettison you beyond its petals into its vibrantly vivacious volcanic whirlpool of rich red and fervid fuchsia color. Its stigma glowing like electric embers. So warm. So intoxicating. Allow it to draw you in and savor its splendor. It's funny. I usually take cactus for granted. Most are covered in unfriendly spines that give them a rather beastly reputation as mean plants. Plants that bite, mangle, and maim. Wonder why that is? When I see something as beautiful as what's posted above I think I get it. Nature has created the cactus as a plant to be respected and relished. Spines serve an evolutionary purpose as well as, perhaps, a defense in which these plants request that they be left in peace to do their thing. Respect them in nature or in care and they will reward you with some of the most unparalleled beauty you have ever seen! The cactus flower combinations just keep on coming! Check out the floral phantasy of Notocactus scopa var. murrielii. This color palette brought to you by nature... not Pantone. Beyond beautiful and infinitely inspiring.